It’s a challenging prospect. Only government space agencies from the US, Russia and China have previously managed soft touchdowns. SpaceIL, the non-profit behind the project, hopes Beresheet (“In the beginning” in Hebrew) will prove an inspiration to all those who follow its progress. “By what we’re doing and achieving with the limited resources that we have, and the limited finances we had – I think we showed the Israeli ingenuity,” said key donor and SpaceIL chairman, Morris Kahn. “We show our initiative, and we’ve developed technology, which I think is going to be important. I think we gotta take Israel into space,” he told reporters on Monday. The robot’s onboard magnetometer device will acquire measurements – and not just in one location, because Beresheet will, some hours after landing, hop to a new spot. 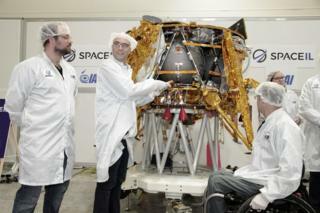 It’s planned for the robot to keep operating for about two days on the lunar surface. The success of the mission will depend in large part on the spacecraft’s UK-sourced Leros engine. But Nammo’s engineers have adapted the Leros for Beresheet, shortening its nozzle and increasing its thrust. “Normally, when people use our engines they will start them up and leave them running for hours at a time before shutting them down for perhaps days, even weeks,” he explained. The robot is actually piggybacking a ride on the flight, which has the primary function of placing a new telecoms satellite in orbit for the Indonesian company Pasifik Satelit Nusantara.